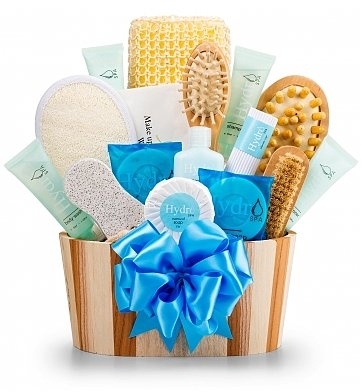 Relax and unwind after a long day with this rejuvenation spa collection featuring eucalyptus shampoo and conditioners, herbal lotions, an exfoliating loofa sponge, massaging brushes, shower gel, and deep-cleansing soaps for the face and body, all in a keepsake spa bucket. Inspired by the Scandinavian tradition of long therapeutic soaks in an outdoor spa after freshly fallen snow, it's a premium gift experience that brings immense satisfaction with no stress on your wallet. Eucalyptus Shampoo, Conditioner, Shower Gel and Body Lotion. Eucalytpus Honey Facial Bar, and Body Soap. Herbal Hand & Body Lotion.